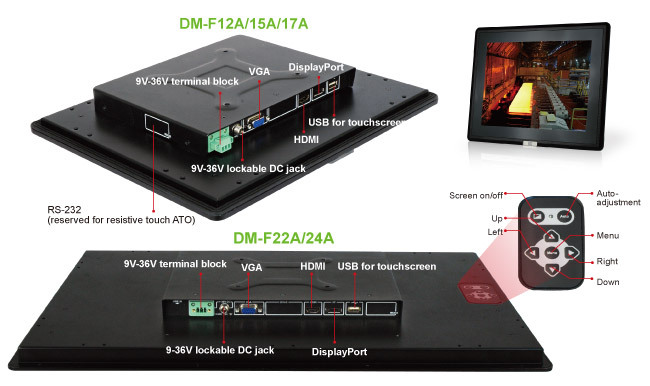 DM-F provides comprehensive video input from conventional analog VGA to broad bandwidth digital HDMI and DisplayPort to fulfill different needs. Gamma correction enables each panel model to follow the specified look-up-table (LUT) in gamma curve doing color adjustment through software encode. In this way, various monitors can display in an unified color by following Gamma 2.2 standard for PC products, ensuring color consistency for multiple monitor applications. Power requirement varies from applications. DM-F series provides 9V~36V DC input which simplifies system integration through adapter or DC source. In order to keep the front panel simple and clean, the membrane keypad of the DM-F series is located on the rear panel to prevent the possibility to adjust the setting accidentally. The DM-F series provides an optional cable cover for easy and neat cabling. Asides from physical membrane keypad, IEI also provides smartOSD software application to help users to adjust monitor color settings and power management setting from a PC control terminal. Design for outdoor applications, DM-F series support wide operating temperature from -20oC to 60oC for 12” to 17” models. 22” and 24” are by project request.